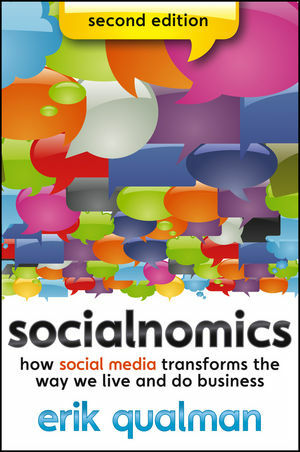 Socialnomics is an essential book for anyone who wants to understand the implications of social media on our daily lives and how businesses can tap the power of social media to increase their sales, cut their marketing costs, and reach consumers directly. In this revised and updated second edition, author Erik Qualman presents new material based on meeting with 75 Fortune 1000 companies, 50 colleges and universities, and over 100 small businesses & non-profits since the first edition. Qualman's materials have been used from IBM to NASA to Harvard to local businesses. Social media can transform your business and your relationship with consumers. Discover what social media can do for you, and what you can do for others while using social media. ERIK QUALMAN was voted the 2nd Most Likeable Author in the World behind Harry Potter's J. K. Rowling. Fast Company ranks him as a Top 100 Digital Influencer, and PC Magazine lists his blog as a Top 10 Social Media blog. A frequently requested international speaker, he has been featured on media outlets including 60 Minutes, the Wall Street Journal, and ABC News. He is listed as a Top 50 MBA Professor and has served as the Head of Marketing at Travelzoo®. Yet, he may be best known for writing and producing the world's most watched social media video.